February 2014 | Wiggle Room | Organization for Busy Moms!Wiggle Room | Organization for Busy Moms! Recently we’ve addressed organizing paper for grown-ups: mail, important documents, and tax paperwork. 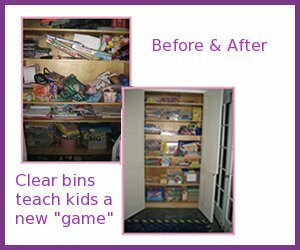 But anyone with kids knows that the amount of paper that they generate can be just as great, and keeping it organized presents its own kind of challenge. 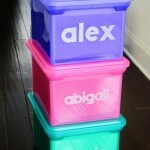 One idea we’ve come across for organizing your kids’ schoolwork is labeling a plastic file box for each child, and putting all of their school work (and photos of bigger projects) into the box as soon as they bring it home. You’ll go through it at the end of the school year, and weed out the save-worthy from the recyclable. So easy, so practical. I love this approach because revisiting the box will be a walk down memory lane, while time will determine what’s worth saving and what’s not. And as your kids age, they may enjoy participating in this project with you. Are you an employer, an employee, self-employed, or some combination thereof? Do you need to factor in other things, such as charitable giving or investment-related income? Did you buy or sell a car or a house? Have a baby? Pay tuition? Complex and varied situations means there’s no one size fits all scheme. However your situation breaks down, whether your preparing your taxes on your own, or with the help of a professional, you want ALL of the relevant papers ready and organized. As mentioned last week, we’re huge fans of using durable plastic accordion folders to keep everything organized. Regardless of the specifics of your situation, everyone’s tax prep comes down to 3 major categories: income, expenses/deductions, and investments. Getting organized (& maximizing your refund!) means no hunting for a lost receipt or W-2 once you sit down to file. For some people, this is as simple as a single W-2 from an employer. But as the number of sources of income increase, so does the paper trail. Make sure to collect in this folder all W-2’s (pro-tip: helps to keep December’s paystub too to verify your W-2 is correct!) and 1099’s. 1099’s come in many flavors, so if you have interest bearing accounts (1099-INT or 1099-DIV) or miscellaneous income (1099-MISC) you’ll want to collect those hear as well. Only you know if this applies to you or not, but if you make regular investments, you may have some 1099-B forms, or if you’re involved in a partnership or LLC, you may have some K-1’s. Keep in mind, these forms all have a corresponding copy at the IRS, so you’ll want to make sure you account for them in your tax prep! You can shred pay stubs, once you know that they match up with the W2 issued by your employer. The rest of the materials that you’ve used to prepare your taxes should be consolidated and put in a safe but out of the way place for 7 years, should you ever be audited. 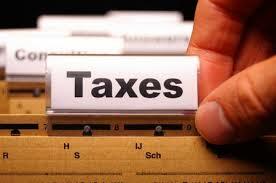 While it’s still somewhat early, take the time to prepare mentally and get your papers in order for taxes. And if you haven’t been as proactive as you could have been this year, it’s the right time to start employing these strategies for next year, to make tax time as easy as possible.